This is not a cookbook. This is something more: a travelogue, a patient investigation of Italy’s cuisine, a loving profile of the everyday heroes who bring Italy to the table. 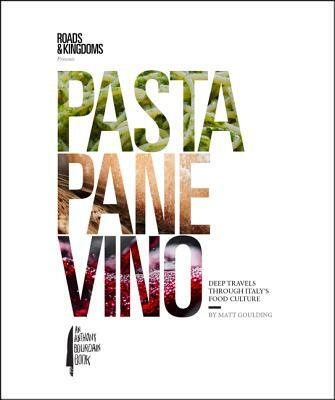 Pasta, Pane, Vino is the latest edition of the genre-bending Roads & Kingdoms style pioneered under Anthony Bourdain’s imprint in Rice, Noodle, Fish ( 2016 Travel Book of the Year, Society of American Travel Writers ) and Grape, Olive, Pig ( 2017 IACP Award, Literary Food Writing). Town by town, bite by bite, author Matt Goulding brings Italy to life through intimate portraits of its food culture and the people pushing it in new directions: Three globe-trotting brothers who became the mozzarella kings of Puglia; the pizza police of Naples and the innovative pies that stay one step ahead of the rules; the Barolo Boys who turned the hilly Piedmont into one of the world’s great wine regions. Goulding’s writing has never been better, in complete harmony with the book's innovative design and the more than 200 lush color photographs that introduce the chefs, shepherds, fisherman, farmers, grandmas, and guardians who power this country’s extraordinary culinary traditions. From the pasta temples of Rome to the multicultural markets of Sicily to the family-run, fish-driven trattorias of Lake Como, Pasta, Pane, Vino captures the breathtaking diversity of Italian regional food culture. A James Beard Award–winning writer, Matt Goulding has never been better, writing in complete harmony with the book’s innovative design and the more than 200 lush color photographs that introduce the chefs, shepherds, fisherman, farmers, nonne, and guardians who power this country’s extraordinary culinary traditions. From the pasta temples of Rome to the multicultural markets of Sicily to the family-run, fish-driven trattorias of Lake Como, Pasta, Pane, Vino captures in a breathtaking tribute the diversity of Italian regional food culture.